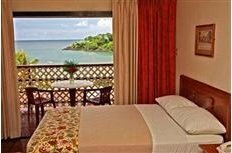 Grafton Beach Tobago resort is located at Black Rock Tobago, just a 20 minutes drive from the Crown Point Airport and the Scarborough seaport. If you are interested in scuba diving on the south western end of the island Grafton Beach Resort is in an ideal location. They offer all inclusive packages, for breakfast, lunch and dinner. During your surface intervals enjoy tennis, swimming pool and gym facilities. They also have an all inclusive package that you should ask about in advance. You can enjoy rooms that are designed with tropical ideas in mind.